When the AEB is not working properly, the AEB warning light ( ) will illuminate and the warning message will appear for a few seconds. After the message disappears, the master warning light ( ) will illuminate. In this case, we recommend you to have the vehicle inspected by an authorized Kia dealer. The AEB warning message may appear along with the illumination of the ESC warning light. The AEB is only a supplemental system for the driver’s convenience. The driver should hold the responsibility to control the vehicle operation. Do not solely depend on the AEB system. Rather, maintain a safe braking distance, and, if necessary, depress the brake pedal to lower the driving speed. The AEB may unnecessarily produce the warning message and the warning alarms. Also, due to the sensing limitation, the AEB may not produce the warning message and the warning alarm at all. When there is a malfunction with the AEB, the braking control does not operate upon detecting a collision risk even with other braking systems normally operating. The AEB operates only for the vehicle / pedestrian in front, while driving forward. It does not operate for any animals or vehicles in the opposite direction. The AEB does not recognize the vehicle, which horizontally drives across the crossroad, or the vehicle, which is parked in the horizontal direction. If the vehicle in front stops suddenly, you may have less control of the brake system. Therefore, always keep safe distance between your vehicle and the vehicle in front of you. 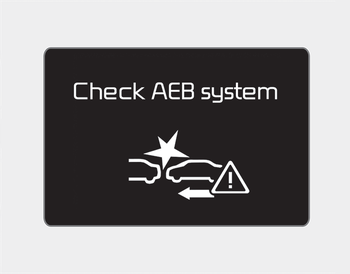 The AEB system may activate during braking and the vehicle may stop suddenly. And the load in the vehicle may endanger passengers. Therefore, always be mindful of the load volume in the vehicle. The AEB system may not activate if the driver applies the brake pedal to avoid risk of collision.